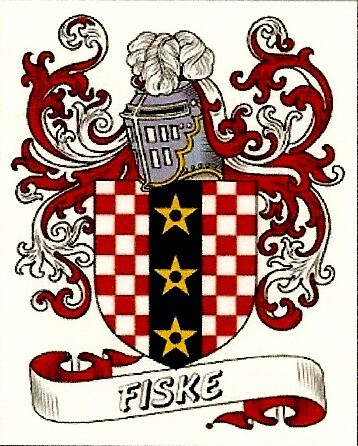 William FISKE (1613 – 1654) was Alex’s 10th Great Grandfather; one of 2,048 in this generation of the Miller line. William was born about 1613 in England. His parents were John FISKE and Ann LANTERSEE. He emigrated to America in 1637 with his mother and brother, Rev. John Fiske. His father died died in 1633 at St. James, S. Elmham, England. His mother died on the trip to America. William first settled at Salem where he received a grant of land. He became a member of the Salem church on July 2, 1641. He married Bridget MUSKETT about 1641 in Salem . He was admitted freeman in Wenham, Mass on May 18, 1643 and was the first chosen town clerk in 1644. He was elected Representative from Wenham to the General Court of the Commonwealth from 1647 to 1652. William died intestate in Sep 1654 in Wenham and therefore most probably of some sudden and acute disease. An inventory of his estate was taken 16th 7 mo., 1654. Bridget Muskett was born c. 1618 in Pelham England. After William died, Bridget married Thomas Rix, a barber and surgeon, on 3 Sep 1661. Bridget and Thomas had one child named Theophilus bapt. 20 Aug 1665. Bridget died in 1703. Thomas Rix was born 1622 at Canninghall, England. His parents were son of Robert Rix and [__?__] He was in Salem as early as 1649. He was a barber surgeon, and spent his last days with his son James in Old Preston, Connecticut, where he died 30 Oct 1718. He was buried in the “Rixtown Cemetery” in Old Preston. Thomas first married Margaret [__?__], widow of Miles Ward, who died May 24, 1660. His children included: Remember, Sarah, Esther, Thomas, James and (his youngest with Bridget), Theophelus. William’s great grandfather Robert1 had a bunch of sons, and two of them were Thomas2 and William2. William’s son John3 produced two particularly brilliant fanatics; Rev. John Fiske, and William4 Fiske. They went to Salem and Wenham. Rev. John Fiske served as pastor at Salem briefly and then went elsewhere to practice religion and medicine in the wilderness and teach college. William stayed at Salem and had Deacon William Fiske5, who was one of the jurors in the witch trial. Thomas2 had Thomas3, whose son Phineas4 went to Salem and Wenham, and his son Captain Thomas5 and Thomas’s son Captain Thomas6 were foreman and juror on the jury. I get third cousins and third cousins once removed. All three of the Fiske cousins later signed the admission of error or whatever admitting the error of the Salem Witch Trials. The Fiskes, who have resided in Wenham, occupied farms situated in the western part of the town, and probably seldom or never lived in any other portion of the place; and when they left to settle in the adjoining towns, it was in the immediate vicinity of the original settlement ; namely, in the northeast corner of Danvers and southeast side of Topsfield. 18 May 1643 – Made freeman of Wenham. 1646 – Licensed to sell wine and strong water. Sep 1654 – He appears to have enjoyed to a large extent the confidence and respect of his townsmen, but was cut short in his career by death in 1654, under forty years of age and having in eleven years served Wenham in all positions of trust within the gift of the people. He died intestate and therefore most probably of some sudden and acute disease. An inventory of his estate was taken 16th 7 mo., 1654; and his widow afterward married a Rix, and was alive in 1674, as Rev. John made her a legatee, also calling her the mother of his brother William’s children. Samuel’s first wife Phebe Redington was born 7 Apr 1655 in Topsfield, Essex, Mass. Her parents were Captain John Redington and Mary Gould. She was the widow of Thomas Bragg (1649-1675). Phebe died 1 Oct 1696 in Wenham, Essex, Mass. Samuel’s second wife Hannah Somes was born 3 Sep 1658 in Gloucester, Essex, Mass. Her parents were Morris Somes and Elizabeth Kendall. Her grandparents were John KENDALL and Elizabeth SACHERELL.. She first married in 1668 to William Allen (b. 1646 in Salem – d. 29 Dec 1696 in Manchester, Mass,) Hannah died 30 Jan 1722 in Gloucester, Essex, Mass. Samuel was admitted as a freeman in Wenham on March 25, 1685. He held the offices of tythingman, constable and selectman. He left a large estate, which, before his death, he deeded to his sons. Benjamin’s wife Bathsheba Morse was born 20 Jul 1653 in Medfield, Norfolk, Mass. Her parents were Deacon Daniel Morse and Lydia Fisher. Bathsheba died 4 Jan 1737 in Medfield, Norfolk, Mass. This entry was posted in 12th Generation, Immigrant - England, Line - Miller, Pioneer, Public Office, Tavern Keeper and tagged Wenham Founder, Wenham Mass. Bookmark the permalink.